OHSWEKEN - Many people had lots to say about Bertha Skye. But at a tribute to her Sunday, Mrs. Skye said a lot more about herself without saying anything at all. She was a member of the native team that won 11 medals, including seven gold, at the World Culinary Olympics in Frankfurt, Germany last month, and was at the Six Nations Community Hall on Sunday for a feast in her honor. But she didn't just bask in the glow of the praise and accolades that came from her neighbors. She also helped prepare the food for the feast that attracted more than 70 people. And she hasn't just been sitting around collecting congratulations from her neighbors since returning home from the culinary Olympics. She has been busy - very busy. "It has been hectic," she said of her return home. "I've received so many calls and been going to schools to talk to children." Recently she participated in career week activities at J.C. Hill Elementary School to share her experiences. "I talked to them about careers and encouraged them to pursue their cooking skills if they are interested in cooking," Mrs. Skye a 60-year-old Cree said. The excitement created by her and the team's success hasn't died down. And the success exceeded Mrs. Skye's expectations. "I didn't really expect to do so well," she said. "I thought I'd be happy if I won one bronze medal." Prior to the feast Mrs. Skye, who was joined by teammate David Wolfman of Toronto received flowers and gifts from members of the community. 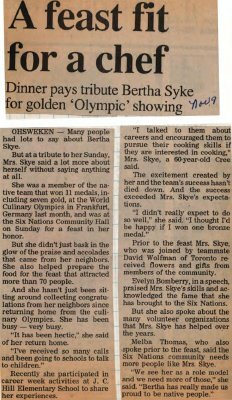 Evelyn Bomberry, in a speech, praised Mrs. Skye's skills and acknowledged the fame that she has brought to the Six Nations. But she also spoke about the many volunteer organizations that Mrs. Skye has helped over the years. Melba Thomas, who also spoke prior to the feast, said the Six Nations community needs more people like Mrs. Skye. "We see her as a role model and we need more of those," she said. "Bertha has really made us proud to be native people." Skye, Bertha ; Bomberry, Evelyn ; Wolfman, David ; Thomas, Melba. World Culinary Olympics ; J.C. Hill Elementary School.